NAPLAN survey results are in: time for a review! More than four and a half thousand teachers and school leaders have completed the QTU’s NAPLAN and MySchool member survey, and the results are clear: it is time for an urgent review of not only the NAPLAN testing regime but also the way practices surrounding the test have emerged and become a part of the culture of schools and the Department of Education over the ten years since the testing program was introduced. The survey findings were in some ways unsurprising, but they certainly confirmed that teachers and school leaders hold genuine concerns about the impact of the tests. The QTU has raised these concerns on behalf of members in the past, but there is no doubt that our industrial action implemented banning the 2018 introduction of NAPLAN Online in 96 schools has been successful in drawing national attention to the need for a review. 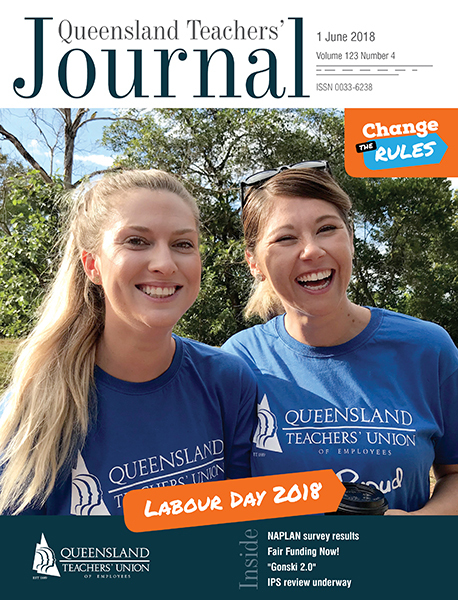 The commencement of the Queensland-based review of the test, announced by Minister Grace at QTU State Council in March, is imminent. While reviews at the federal and state level are welcome, it is essential that teachers and school leaders ensure their voices are heard by taking up opportunities to participate in consultation and telling their stories. The full report of the survey can be viewed on the QTU website at www.qtu.asn.au/NAPLAN, however here are some of the findings. 46 per cent of teachers and principals responding to this survey never or rarely use the NAPLAN student data. Over half (57.4 per cent) find the data from NAPLAN either useless or barely useful in their teaching practice. 85 per cent of respondents have practice tests conducted at their school in preparation for NAPLAN and feel the time used on this could be better spent elsewhere. QTU members do not think that students’ experience of school is enhanced by NAPLAN testing. In fact, two thirds (66.6 per cent) think that if NAPLAN testing ceased to exist tomorrow, their students’ experience of school would be better. 65 per cent of teachers and principals feel that if NAPLAN testing ceased to exist tomorrow, their job satisfaction would be higher. Almost all respondents (94 per cent) think that NAPLAN testing is not low stakes or light touch. 80 per cent of teachers and principals said that the protections put in place to prevent league tables being published have been unsuccessful. Teachers and principals are not very supportive of NAPLAN in its current form, with 78 per cent stating that they think student outcomes have not improved over the past 10 years. Two thirds think that NAPLAN has in fact been harmful. Teachers and principals overwhelmingly agree that it is time for the government to have a rethink on NAPLAN, with 93 per cent wanting a comprehensive review into NAPLAN or national standardised testing to be conducted in this country. Now that NAPLAN is over for another year, let’s keep up the pressure to see the testing regime either replaced, or fundamentally reconsidered.